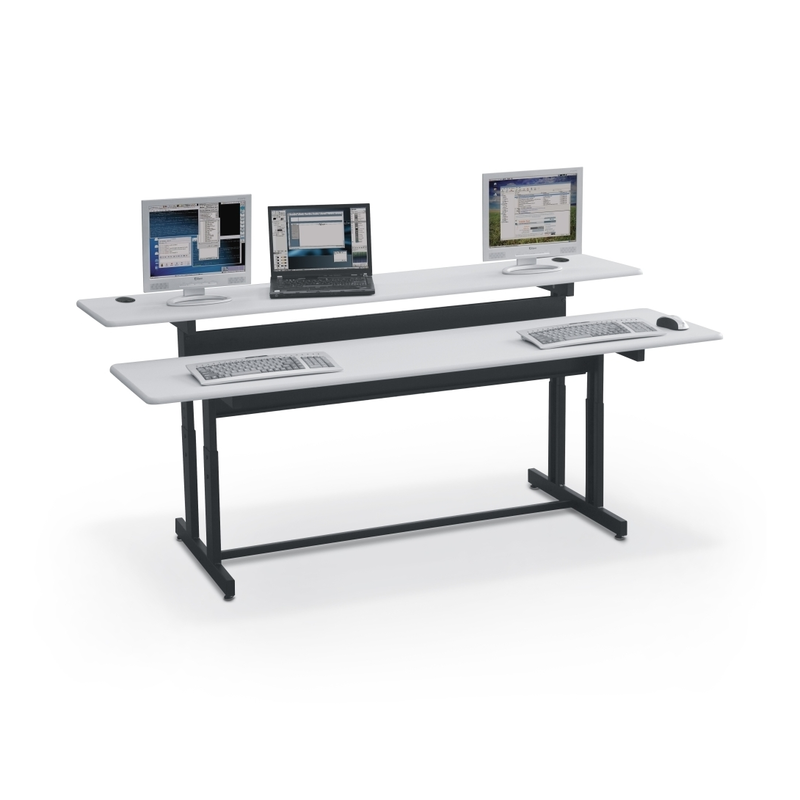 The Split Level Double User Ergonomic Computer Workstation is the ideal economical workstation choice for classrooms, computer labs, training rooms, or offices. Featuring two independently height adjustable platforms to accommodate a variety of users, the Split Level is available in a 36" width for a single user, or in a 72" width for dual users. Each platform is adjustable from 25 1/2" to 31 1/2" high to provide the correct ergonomic height. Set the back platform (17"D) lower than the front platform (19"D) to give an unobstructed view of the trainer or instructor. Each workstation includes a CPU holder and a desktop grommet (2 each for the dual-user workstation). Optional bottom-mount cable management conduits are available. The frame is constructed from black powder-coated steel for superior durability, and the platforms are scratch-resistant gray laminate. 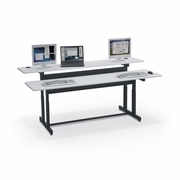 The design of the Split Level table features two independently adjusting platforms that allow an unobstructed view of the teacher or presenter. The platforms adjust from 25 1/2" to 31 1/2" high to allow the correct ergonomic height. The keyboard platform measures a spacious 19" deep and the monitor platform measures 17" deep. The Split Level 72 for dual users includes two CPU holders and two grommets for controlling cables. Tables feature a black steel frame with gray tops. Optional cable management trays are available.